Chrissi's Scrappy Space: Christmas Pic and Scrap the Boys layout. 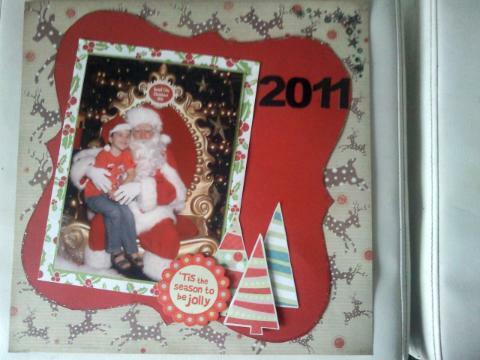 Christmas Pic and Scrap the Boys layout. This is the first layout ive done in a long time. Things have gotten away form me and i havent had alot of time to scrap. But after i saw this photo of my little man i had to scrap it. Every year we TRY and get a santa pic. Try being the pivotel word. we've only succeded the year he was born, due to the fact he was 6 weeks old lol. My little man was recently diagnosed with Autism. So we decided to take him to see santa to see if he could get use to him and eventually get a photo. We werent expecting a photo, and it didnt bother us if we didnt get one last year. We just wanted to try. So we took him down to visit santa. We explained to santa that he had Autism and santa was amazing with him. He sat back and had a chat to him and made him feel comfortable. We left and said we'd see santa next time we were in the shops. My little man decided toplay on the cars while i was talking to my mum and sister outside santas work shop. Next thing we knew my little man walked up to santa all by himself, sat on his lap and smiled for the camera. we couldnt believe it. We told the photographer to just snap away and the result was this fantastic pic. Not only is it a mission to get him to look a a camera but to smile aswell, we couldnt believe it. The whole moment was amazing, we were floored. A week later i went and told santa thankyou and how greatful i was and that i believed it was the people he encounters that make the difference in making him feel comfortable. Even more amazing santa remembered my little man. Ive decided to enter this layout into the Scrap the boys challenge. I dont usually enter my Layouts in challenges but i thought i should give it a go form now on.